"You need to consider everything you're putting at risk, and not just for yourself." 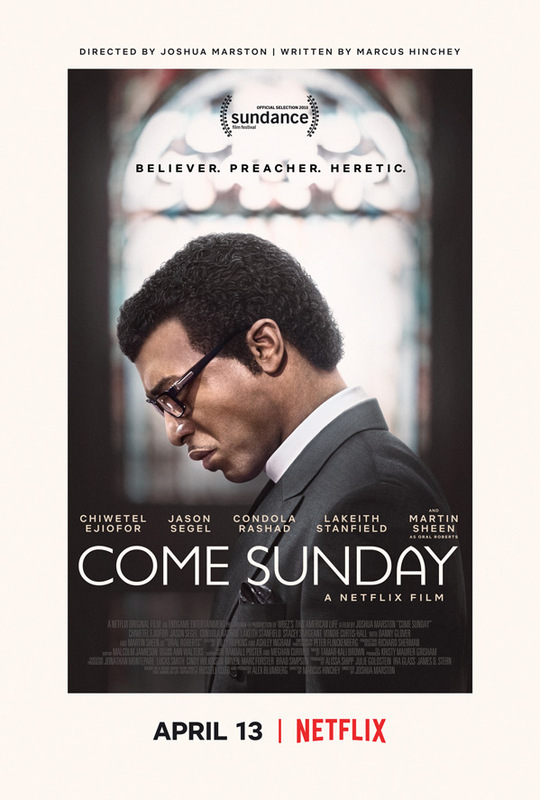 Netflix has released the first official trailer for a film titled Come Sunday, which premiered at the Sundance Film Festival earlier this year. Oscar-nominated actor Chiwetel Ejiofor plays Bishop Carlton Pearson, an evangelical megastar, brilliant orator, and television host with millions of followers. He suddenly has an epiphany one day and realizes: God loves all humankind; everyone is already saved, whether Christian or not; and there is no hell. But preaching this gets him into all kinds of trouble. The cast includes Danny Glover, Condola Rashad, Jason Segel, Lakeith Stanfield, and Martin Sheen. These kinds of religious dramas aren't really my jam, even with Ejiofor in the lead role, but I have to admit - damn does this trailer look good. Watch below. Internationally-renowned pastor, Bishop Carlton Pearson (Ejiofor) — experiencing a crisis of faith — risks his church, family and future when he questions church doctrine and finds himself branded a modern-day heretic. Based on actual events. Come Sunday is directed by American filmmaker Joshua Marston, director of the films Maria Full of Grace, The Forgiveness of Blood, and Complete Unknown previously. Marston was previously a journalist for Life and ABC News before becoming a filmmaker. The screenplay is written by Marcus Hinchey. This first premiered at the Sundance Film Festival earlier this year. Netflix will release Marston's Come Sunday streaming exclusively starting on April 13th coming up soon. Interested?